It was on Friday late-afternoon that hubby called me up and told me that we were having a get-together on Saturday night at a friends’ house to celebrate his wife’s birthday.Along with some dishes,I was requested to bake the Birthday Cake:)! !Though my heart did a leap at the prospect of a new baking experiment,it started pressing the panic button too soon at the thought of serving the cake to the guests-which btw included hubby’s boss and wife!! 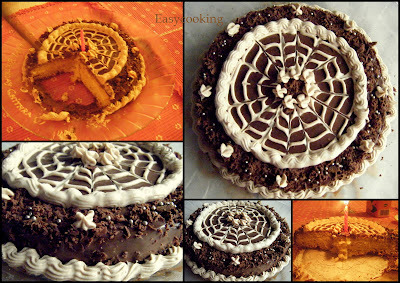 I baked the cake immediately,lest I change my mind later.Then one by one I went about making the filling and the frosting.Since the birthday was a day later,I had lots of time to re-do if at all things went wrong[which,Thank God was not required]. The cake was a breeze to make. [Now I can say this..but while making it I was jumping up and down the floor in tension].Whipping the cream was a tough task,but I was very patient[for a change]and got the required results.Making the ganache was the easiest step-I really don’t know why I kept shying away from ganache all this while.Ganache frosted cakes..here I come..:). Transporting the cake was another hiccup.I placed it on my lap and the AC was on full blast lest the frosting decide to do a melting game.But nothing like that happened and I was able to present the cake to the birthday girl-lady in its proper avatar.The cake was ♥ed by all,chilled to perfection and the flavours gelled with each other,one of my best cakes so far-lookswise and tastewise. I cut the cake into two[was too chicken to attempt 3-4 layers]. Skipped the almond paste in the whipped cream. Mixed some leftover ganache with the whipped cream and went crazy piping swirls and designs and what not. Take my word for it and bake it for your friends family or why,even for yourself.If I can make it look like this,believe me,anyone can!! Thanks to Deeba for the wonderful recipe and Ria for the required push..:).♥ ya peeps:). Recipe adapted from Mandarin Orange Cloud Gateau by Sue Ross, pg 17;Re-adapted from Deeba. Silver dragees, orange slices, powdered sugar etc for garnishing. Preheat the oven to 190 degrees C. Line an 8" springform tin. (the original recipe uses 2 8" sandwich tins)-I used a normal 8' cake tin. Sift the cornflour + flour + baking powder + salt + icing sugar (yes, it's correct) into a mixing bowl. Beat the egg whites till they stand in soft peaks & keep aside. Lightly beat the oil + water + yolks together & stir into the dry ingredients. Beat until smooth, & stir in the juice & zest. Fold the whites gently into the yolk mixture. Turn into lined tin & bake for about 45 minutes till well risen & golden brown. Check if it is done with a wooden pick. ( Slide a sheet of foil lightly over the top if it begins to brown too fast). Leave in tin for 10 minutes, & then cool completely on rack. Once cool, cut into 2 or 3 layers. Whip the cream + sugar till firm. Whisk in the ground almonds. Reserve a little cream for the topping, & sandwich the layers with the rest. Put the cream & dark chocolate into a pan heat over low heat till all the chocolate has melted, stirring constantly. Stir well, & leave to cool. Frost the sides & top of the cake with the ganache. 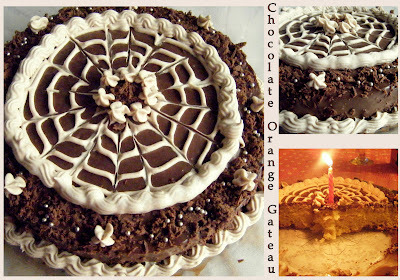 Decorate the top with grated chocolate curls & pipe a design with the reserved almond cream. Top with a few slices of orange, chocolate shavings & silver dragees etc. Chill well & serve right out of the fridge! This gateau doesn't need to sit at room temperature for a while; it's great! -Believe me,it truly is!! That is a very professional looking cake. Good Job divya! !Cake looks like store-bought..
Saluting you first,for attempting something new when you are about to give it as a b'day cake..real daring Divya...But its beauty..marvellous and yummy..great recipe.. I love chocolate and orange. The cake looks so good, you have decorated it beautifully. this looks so tempting that I want to eat a slice, no, more than a slice, right NOW!! Wow! Looks scrumptious! Enjoy your trip to Kerala and be back with more cakes. This cake looks soo yummy and beautiful and awesome and superb...I mean really I have no words. It looks great. That is a beautiful cake, I remember seeing it on Ork pics, am I right? Wow what a lovely cake Divya wish I could get one piece. I am waiting when I couls dare to make something like this. You have baked like a pro... Great job. I am sure you will be flooded with baking requests in future. I love that combo first of all,chocolate and orange!! cake looks so cool and definitely should have tasted great,nice icing onthe top!! omg..such a beautiful cake..will surely try this as your words are very encouraging..am stll in india..i was in chennai , but for only a couple of hours..
Wow.. expert cake dear..! Good job! Looks too good Divya..Do try sometime an eggless version too and let me know so that I too can try this.. :-) You have done a good job at decoration too. Good work...your husband must have been so proud of you. :-) btw, which cream did you use? ?amul fresh cream???? Hello - this cake looks awesome. I'm a big fan of chocolate cake in any form or flavor! Beautifully done. Keep it up and bake more! And u call that a breeze??!!!! Hats off to u! It looks super pretty. How can icing be so perfect! That is a beautiful cake, a real work of art ! divya, that cake looks great!! i really like the icing.. i am not much of an icing person.. i hardly ever dress up my cakes with icing.. i must say ur's has come out beautifully! wats was the bday lady's reaction to it? That was a real nice evening with all your lipsmacking dishes. A LOVELY person with great RECIPES that is DivyaKudua. KUDOS and THREE cheers to both the KUDUAS. One who tastes and approves and the other who creates magic for others palate. Priya..I used Amul cream.Keep the tetra pack refrigerated before whipping it up!! Chithrechi...You made my day..:).Thank you so much!! thats so delicoius....can i have a piece please? There is an award for u at my blog...pls accept it dear..
Divu, wot-a-decor frm u!!! U surely hv progressed soooooooo fast! Loved loved loved this one! Am sure ur frnds n family must hv gone ga-ga over the web pattern n all efforts involved! U truly r focused in succeeding on each try! Glad to see this lovely bake n design frm you..dragees,choco shavings n perfect design! Speechless dear you! wow... thats a wonderful cake!!.. its so so perfect and wish I can just grab a piece off the pic right away :)... you have a very very beautiful blog! Wonderful cake...I have a doubt..the recipe says 150 gms of flour (whch shld amount to more than a cup around 1.2 cups) but in brackets the amount in mentioned as 1/2 cup+1/8 cup (..
What does it mean by cream (15% fat)? you have been mentor to me. I have learned baking and emerged by reading yours blogs.I have nearly made all the cakes, but this one is evervbody's fav. thanks alot for being there whenever i feel like baking.